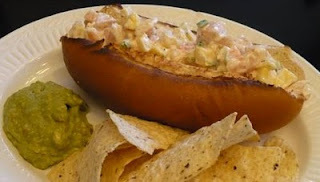 The distinct flavor of the Caribbean comes alive when mango, lime, shrimp and just a hint of jalapeno are combined to create this tasty sandwich. Serve with Spicy Guacamole and chips for a quick summer dinner. Coarsely chop the cooked shrimp. In a medium bowl combine shrimp, mango, mayo, serrano or jalapeno pepper, green onion, lime zest, lime juice, salt and pepper. Cover and chill up to 1 hour. Cut baguette into 4 equal rolls. Slice in half lengthwise. Remove some of the bread from the bottom half of each roll, leaving a thick shell. Place all rolls, sliced side up, on a broiler pan or baking sheet; broil 3 - 4 minutes or until toasted. Place lettuce leaf on bottom of each roll. Spoon shrimp mixture onto lettuce, replace top bun and serve.